Also posting today on the SAIB blog is the talented designer, Mayline. Make sure to drop by and see her beautiful creation as well! Thank you! Amazing no-line watercolor, my friend! I have this stamp still in my NBUS box. This shows me it needs to come out to play. So happy this morning to see your gorgeous card over at Penny Black! Wow, when I first saw this I thought for sure it's designer paper. Your painting is unbelievably gorgeous on this. This card is done to perfection! This is definitely one you should be proud of! Gorgeous no-line watercoloring, Loll! Love your beautiful color palette, too! 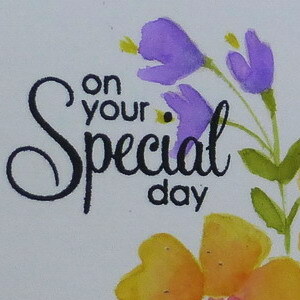 Love the water colour effect on your ever so pretty card Loll....stunning x.
Wow, Loll, your no-line watercoloring is so beautiful that it looks like you watercolored the flowers freehand! Love the cheerful color combination!